As the Wort Moon of July waxes full, this is the time for gathering of herbs. The word wort is old Anglo-Saxon for "herb." When the magickal herbs have been gathered and hung to dry, the time of the Wort Moon is the time to give thanks to the spirits who dwell in the herb garden, and to leave them an offering. 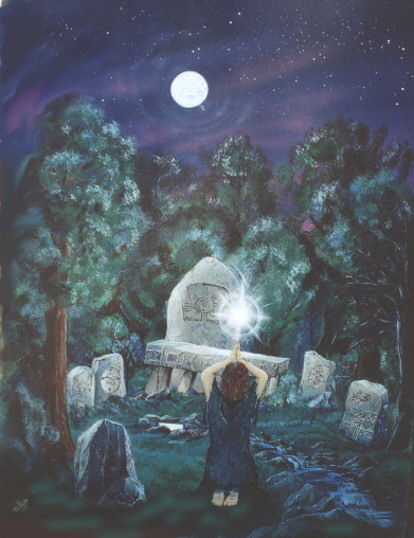 Perhaps as you place an offering in the moonlit garden, they will whisper to you other secrets of herbal magick. In Japan, the Full Moon of July saw the O-Bon, or Festival of Lanterns. This was a conbination of Buddhist and Shinto beliefs that honored the dead. Homes, tombs, and ancestreal tablets were toroughly cleaned. Altars and shines were decorated. The gardens were hung with lanterns to light the way of the dead so that they could join with their families for the three day ceremony. The Egyptian New Year fell in July, as did the Opet Festival, which commemorated the marriage of Isis and Osiris. Their sexual union was said to bring good luck to all people. About the same time in Rome, the love of Venus and Adonis was celebrated . The Egyptian year was measured against the Nile and its yearly fertile floods. If the New Moon is seen for the first time straight ahead, it predicts good fortune until the next New Moon. If there are two Moons (two New or two Full) in the same month, the weather will be unfavorable and unsettled until the next New Moon. Wood cut at the New Moon is hard to split. If it is cut at the Full Moon it is easy to split. Crass crops should be sown at the Full Moon. Then the hay will dry quickly. In Wales, fishermen avoid the Moon line, or the moonlight showing on the water, when setting out to sea; they consider crossing this bad luck. However, in other areas they say to make a wish when crossing the Moon line. Power Flow: relaxed energy; preparing; succeeding. Dream-work, divination, and meditation on goals and plans, especially spiritual ones.Love, health, money, charity.